On Monday morning, special prosecutor Robert Mueller brought the first charges in the Trump-Russia investigation, indicting former Donald Trump campaign chairman Paul Manafort and his long-time top aide Rick Gates, deputy campaign manager, on 12 counts of conspiracy, money laundering, failing to register as a foreign agent and false statements. Manafort laundered millions of dollars of undisclosed payments from the political party of pro-Russian former Ukrainian president Victor Yanukovich over several years. A foreign policy adviser to the campaign, George Papodopoulous, pled guilty to lying to the FBI about his contact with a Russian professor with ties to the Kremlin, according to a newly unsealed court document. 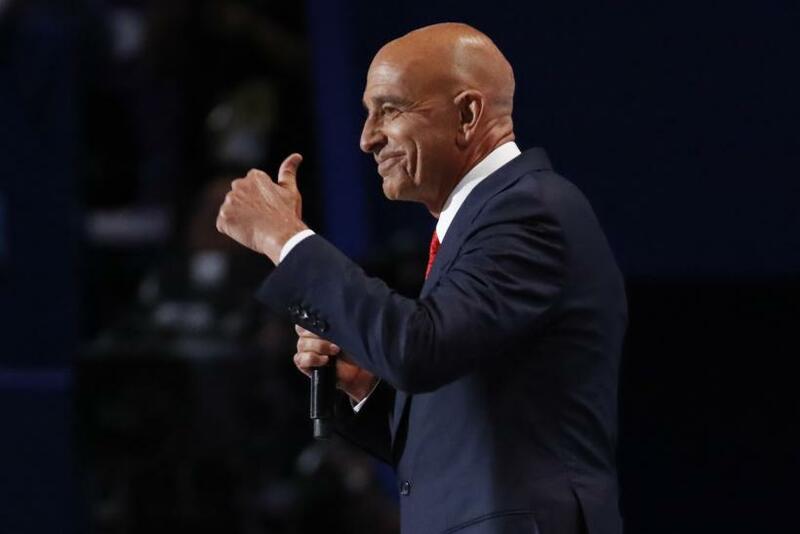 One of Trump’s best friends, billionaire Tom Barrack, is the person largely responsible for uniting Manafort and Gates with Trump. The private equity and real estate investor has known Manafort for 40 years, and he brought the now-indicted operative into the fold of the Trump campaign in 2016, hoping that Manafort could turn around Trump’s struggling campaign. Manafort chaired the Trump campaign from May through August of 2016 and ran delegate operations before and during the GOP convention to make sure the Party didn’t try to take away Trump’s nomination. Conversations between Trump and Manafort continued after the president took office, according to CNN. Barrack is the chairman of private equity real estate firm Colony NorthStar and was worth $1 billion as of 2013, according to Forbes. Described as “unfailingly loyal” to Trump, his friendship with the president goes back three decades. The two met in the late 1980s while negotiating real estate deals, and Barrack went on to help save Trump’s real estate portfolio in 1994. In June 2016, Barrack co-founded an outside super PAC, Rebuilding America Now, which raised $23 million from wealthy conservatives such as Home Depot founder Bernard Marcus and businesswoman Linda McMahon, who was rewarded with a cabinet appointment as head of the Small Business Administration, and corporations hoping for favorable treatment from Trump including private prison company GEO Group. The PAC spent $17 million against Hillary Clinton and $4 million in favor of Trump, according to public data compiled by the Center for Responsive Politics. Barrack earned himself a speaking slot at the Republican National Convention in July 2016, having given $415,000 to a joint fundraising committee that distributed it to the Trump campaign and to the Republican National Committee. Barrack has a history of large donations to the Republican Party, although he’s also contributed to some Democrats — including Diane Feinstein, a senator from California, where Barrack lives — and party groups over the years. As chairman of Trump’s inauguration committee, Barrack led the effort to raise over $100 million for the events from wealthy conservatives and businesses eager to curry favor with the incoming president. After his huge fundraising efforts, Trump offered Barrack the position of Treasury secretary, which he turned down, according to Barack, who wanted to stay, officially, outside the White House. As of August, Barrack was reportedly the front-runner to become the ambassador to Mexico. As president, Trump consults Barrack regularly, whom The Daily Beast describes as one of Trump’s “ top outside advisers.” Barrack was “poised to wield enormous influence in Trump's Washington as the person perhaps closest to the new president outside of his immediate family,” CNN’s Teddy Schleifer wrote in mid-January. Barrack has made regular visits, bringing along Gates, who reportedly began working directly for him after leaving America First Policies, a pro-Trump nonprofit formed after the election. Despite working closely with Manafort in the many criminal acts detailed in their indictment, Gates managed to stay on with the campaign. He worked under Barrack as “the No. 2 man” planning Trump January inauguration. Once Trump became president, Gates joined the pro-Trump nonprofit, America First Policies, where he worked alongside the likes of Nick Ayers, now chief of staff to Mike Pence, and David Bossie, another former Trump deputy campaign manager who is president of Citizens United. Billionaire Trump backers Robert Mercer and his daughter, Rebekah, initially planned to finance the group. Because of the FBI investigation into Manafort, Gates stepped down from America First Policies in March. America First Policies was created to support Trump’s agenda. In addition, it has disclosed spending nearly $2 million on political races this year, opposing unsuccessful congressional candidate Democrat John Ossoff with $1.5 million in his Georgia special election, and supporting GOP Sen. Luther Strange in the Alabama Senate special election. The indictments of Manafort and Gates, and Barrack’s very close relationship with Trump, raise questions as to whether, and how much, Barrack knew about the shady dealings of Trump campaign associates with Russia-aligned Ukrainians or Kremlin-linked Russians themselves.